Jordan Hidajat, a friend of CERC, will bid the church farewell as he returns to Indonesia after completing his tertiary education here in Monash University. 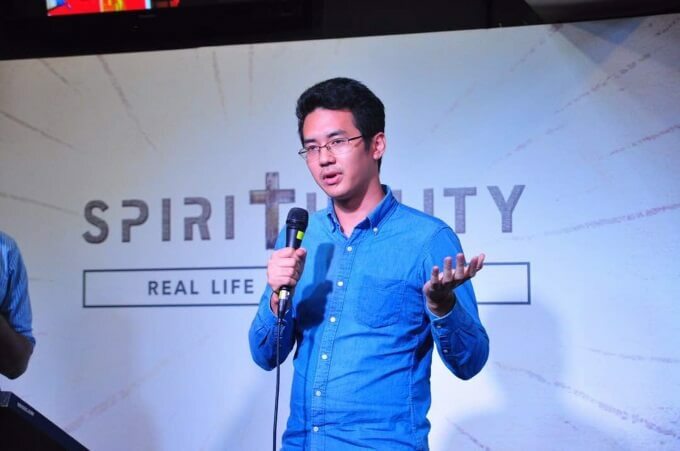 After 4.5 years in Malaysia, Jordan shares with us his experience as a first time attendee in CERC, which grew into attending the church regularly a year later and finally, becoming a member of the church. Hi Jordan, tell us a bit about yourself. Hi, I'm 23 years old and come from Jakarta, Indonesia. I've been in Malaysia for the last 4.5 years pursuing my accounting degree and now that it's completed, I'll be going back to Jakarta. When I go back, I'll be attending Gereja Reformed Injili Indonesia (GRII), a reformed church in Indonesia under Pastor Steven Tong. Tell us about which church you attended when you arrived in KL. During my first week in KL, I went to a popular charismatic church that was introduced to me by a friend from Monash Christian Fellowship (CF). Back in Indonesia, I went to two churches; a charismatic church and a Presbyterian church that my family was attending. I come from a strict Presbyterian family but I didn't know much about denominations back then nor did I understand what a charismatic church was about. I was a pretty "blur" Christian. In the next two weeks, I was introduced to CERC by Jeremy Leng, my uni mate at the time and a current member of CERC. The first time I visited CERC, the gathering was at its first shoplot. I remember that every seat in the hall was occupied and they were doing a series on Heidelberg Catechism. I didn't understand much then and I was falling asleep during the gathering but I forced myself to stay awake. I also remember that we had Domino's pizza for dinner that week! Did you come back the second week because of pizza? Then, what happened after the second visit? But I went back to the first church because they were starting an Indonesian Christian Fellowship there and they were looking for Indonesian members. I figured that I could grow more as a Christian in a language that I was familiar with as back then, my English wasn't that good. They entrusted me with duties almost immediately and asked if I would like to be a prayer leader and be involved in PA, to which I agreed. I see, were you also involved in the CF on campus at the time? Yeap. During my first and second semester, Jeremy invited me to a bible study that was called 5555 (5 bible studies, 5 talks, 5 minutes away, RM5) but I couldn't attend because the timing clashed with my class schedule. In the third semester, I was part of the small groups of Monash CF, called Koinonia Groups (KGs). We met up and read the bible together, and we did the book of Romans at the time. On top of that, my class schedule that semester permitted me to attend 5555 on Tuesdays, and it was on the book of John. Reading Romans together in the KG and working on the book of John at 5555 made studying the bible a culture in the CF. There was once where Mark Leong, a CERC apprentice, preached a five part sermon series in CF on the basics of the gospel. It was similar to what I learnt back in Indonesia, but this time it was delivered with great clarity, and I could see the structure and connections of the doctrines. From then, how did you decide to attend CERC regularly? I joined a Gospel Growth Fellowship (GGF) conference called Word Works on the book of Acts, and subsequently, Thinking Theologically Conference (TTC) on the topic of The Church. I was also listening to online sermons by faithful, gospel-centered pastors at that time, that were introduced to me by a friend. After TTC, I had questions about the church and churching. So a few CERC members like Wilson, Winnie and a few others I knew came to talk to me about it on separate occasions. I knew it was an important aspect of being a Christian and it was necessary to address it but at that time, I was giving excuses to avoid thinking about healthy churching. Sometime in May 2013, I came back to CERC and would cycle to CERC Central for their 4.45pm service. After a church camp called True Grit in October 2013, I decided to commit to CERC. I was really convicted about the truth from the Bible that they were preaching week after week. Okay, so what have you learnt about yourself and ministry, and what will you bring back to ministry in Indonesia? Well, what I've learnt is that there are a lot of aspects to consider to do ministry effectively. It is motivation for me to work harder to build God's kingdom when I see the gap between the founding fathers of the Reformation and myself. I also realised that I have a poor understanding of my Christian roots and barely know any church history. Things that I have to continue to learn is to exegete the bible better and to work on my systematic theology. In terms of ministry, I've learnt that a good church is built not just by preaching from the pulpit but it is more complex than that - it is necessary to create a healthy gospel culture within the church. I also realised that God places the right people at the right place to carry out His work. We hope that you will continue to find all opportunities to serve God in both the word and works ministry when you're back in Indonesia. Before we end, how can we be praying for you and is there anything you would like to add? I would like to thank CERC for the opportunities to serve and the experiences in church that I am privileged to have gone though. Please pray that I will continue to have the same passion and fervor for the gospel back in Indonesia, and not slack. Please also pray that I will not forget all I have learnt from CERC about the Bible, ministry and God's church. I might see you guys in the future if I get to come back for some of the conferences organised by GGF. I will miss you all! We will miss you too, Jordan. Till we meet again, brother, whether in glory or before.